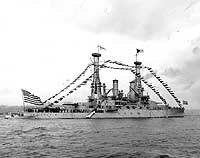 U.S. Navy battleship construction began with the keel laying of the Maine in 1888 and ended with the suspension of the incomplete Kentucky (BB-66) in 1947. 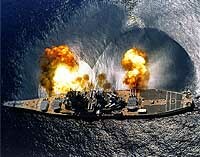 During this almost six-decade-long era, 59 battleships of 23 different basic designs (or "classes") were completed for the Navy. 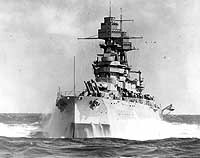 Another twenty battleships and battle cruisers (three more "classes") were begun or planned, but not completed. Seventeen faster big-gun 35,000-60,500 ton battleships (four "classes") begun in 1937-41 (including seven 45,000-60,500 ton ships cancelled or suspended in 1943-47). Gun caliber, as well as ship size, grew steadily, from ten inches in Maine to sixteen inches in the ships finished in the 'Twenties and afterwards. 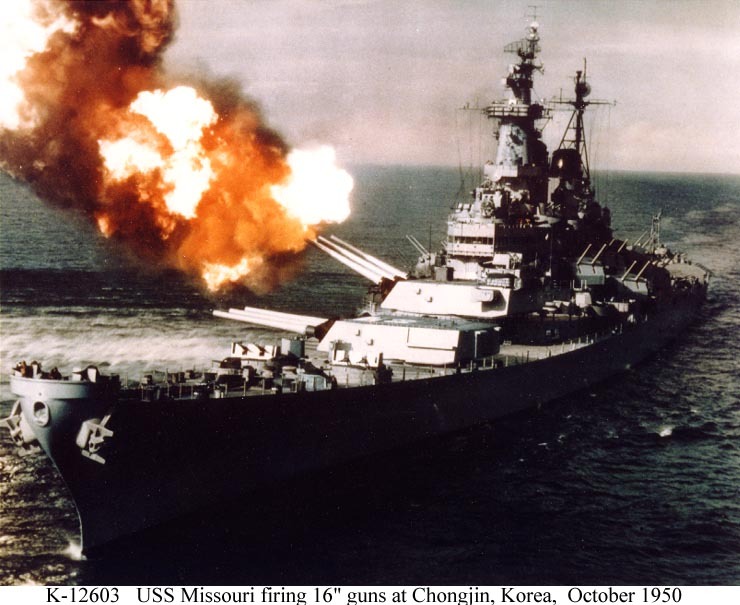 Effective gunnery range also increased, from a few thousand yards to about twenty miles. 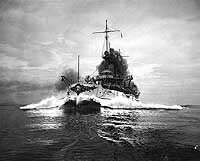 Except for the fast Lexington Class battle cruisers and Iowa Class battleships, these were all relatively slow vessels, as heavily armored as they were armed, intended primarily to steam in formation with their "sisters" and slug it out with similar opponents, using their powerful guns to settle the matter. In their day, they were the "Queens of the Sea", the foundation of national strategic offense and defense. That "day" ended only with the arrival, effectively just before the start of World War II, of aircraft that could not only out-range the big guns, but also deliver blows of equal or greater power. 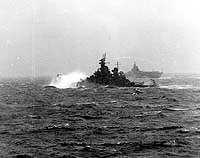 Thereafter, at least in the daylight when the planes could fly, battleships performed as auxiliaries to aircraft carriers. 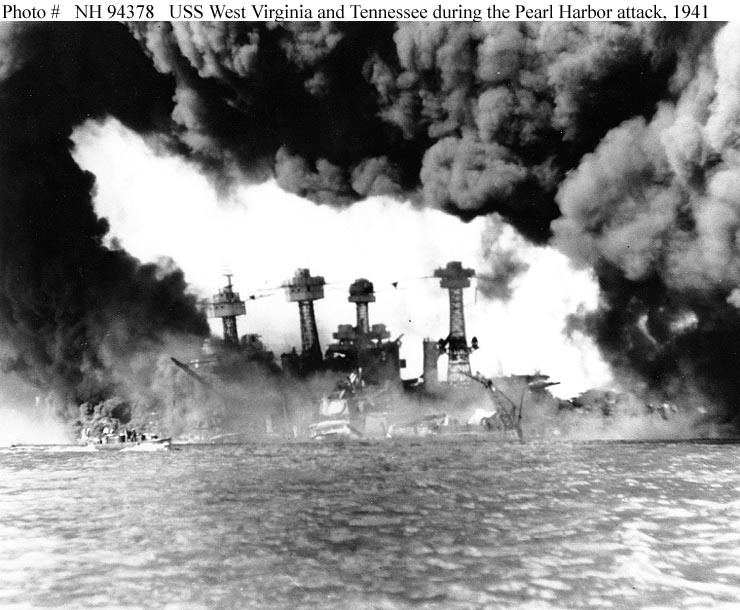 The Second World War brought another mission, shore-bombardment, in which the fire of heavy guns was precisely directed against enemy facilities ashore, to pave the way for invasion or to simply destroy war-making potential. 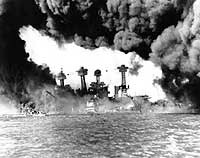 This justified the retention of the big-gun ships in the post-war era and brought them back to active duty on three different occasions. 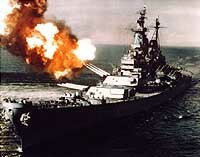 Until 2006, six decades after the last U.S. Navy battleship was completed, two were kept on the Naval Vessel Register for possible future employment in that role. This page features selected photographs of U.S. Navy battleships, and provides links to more extensive pictorial coverage of the individual battleship classes. Lexington Class (CC-1 through CC-6) -- Fiscal Years 1917-19. Montana Class (BB-67 through BB-72) -- Fiscal Year 1941. Coverage of other battleship classes will be added in the future. Though the Alaska class large cruisers (CB-1 through CB-6) of 1941 are actually part of the cruiser design lineage, some sources persist in (mistakenly) referring to them as "battle cruisers". Accordingly, a link is provided here to their class page. 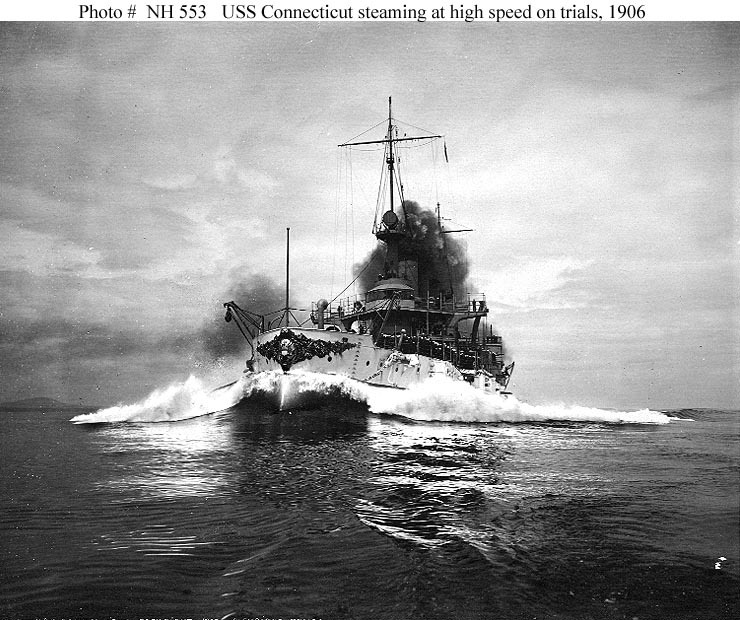 Running speed trials off the Maine coast, 1906. Photographed by Enrique Muller. Note sailors crowding the rails, watching the photographer's boat, which is about to be swamped by the battleship's bow wave. 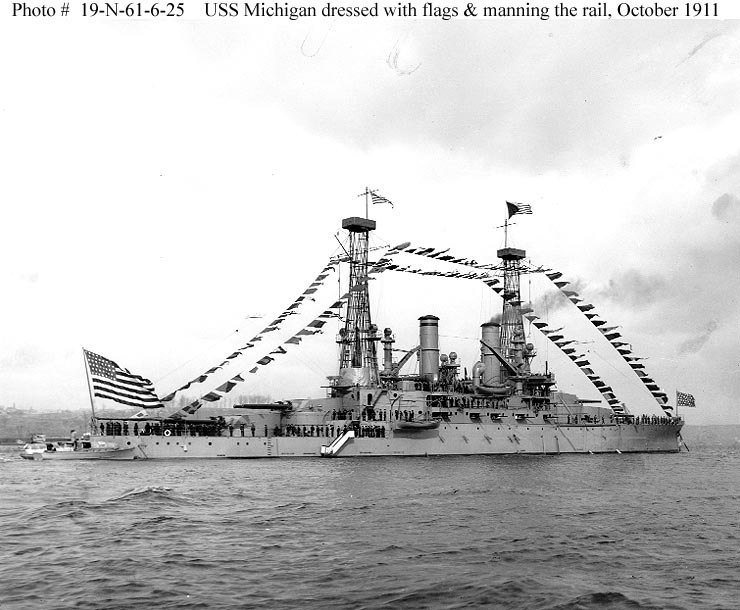 Fully dressed with flags and with her crew manning the rails, during the naval review off New York City, 3 October 1911. 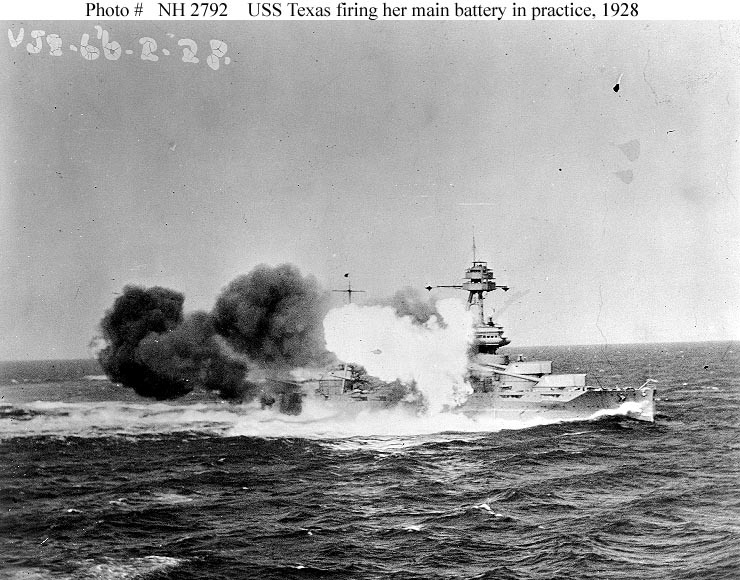 Firing her 14"/45 main battery guns, during long range battle practice, February 1928. Steaming in column off the California coast during the middle or later 1920s. 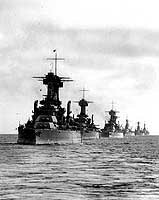 The three leading ships are (in no particular order) Colorado (BB-45), Maryland (BB-46), and West Virginia (BB-48), followed by Tennessee (BB-43) and three older battleships. Photograph taken from USS California (BB-44). 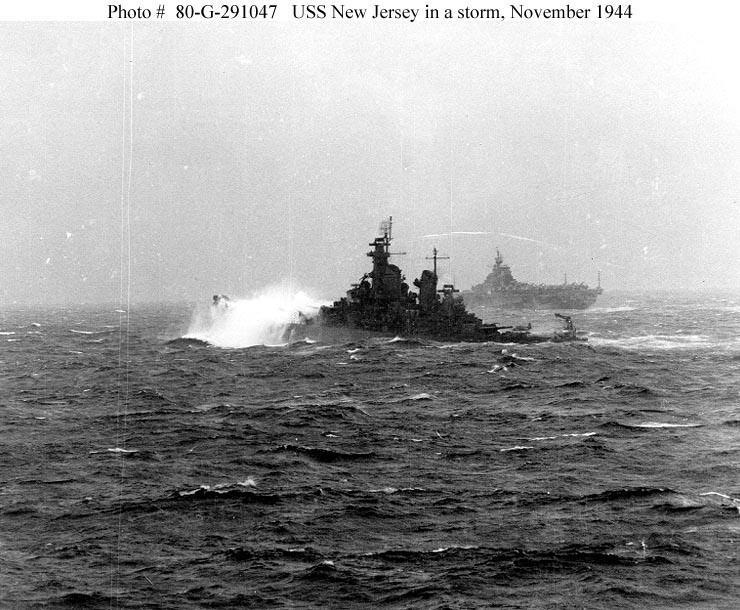 In a stiff storm in the western Pacific, 8 November 1944. Photographed from USS Intrepid (CV-11). USS Hancock (CV-19) is in the background. 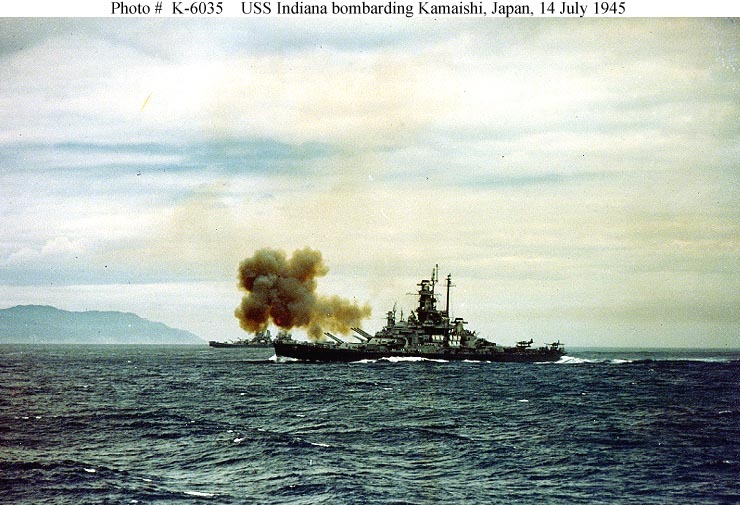 USS Indiana (BB-58) fires a salvo from her forward 16"/45 guns at the Kamaishi plant of the Japan Iron Company, 250 miles north of Tokyo. 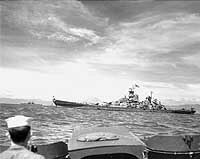 A second before, USS South Dakota (BB-57), from which this photograph was taken, fired the initial salvo of the first naval gunfire bombardment of the Japanese Home Islands. 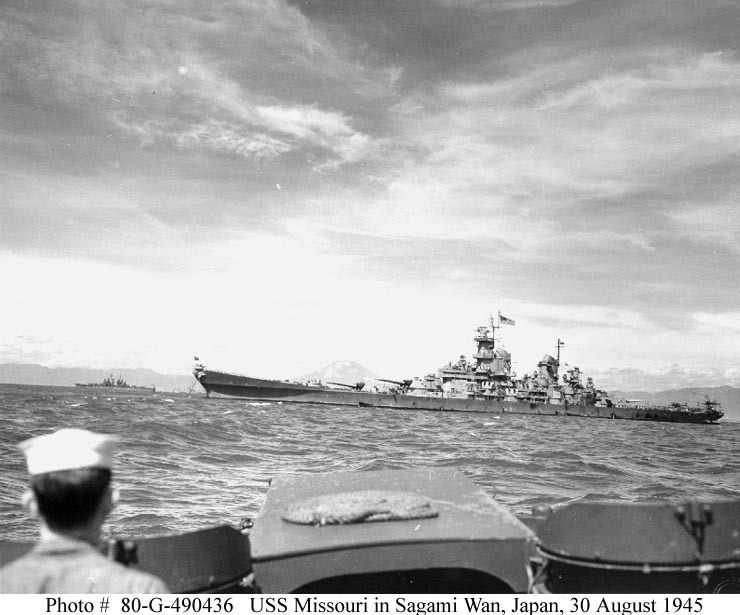 The superstructure of USS Massachusetts (BB-59) is visible directly behind Indiana. 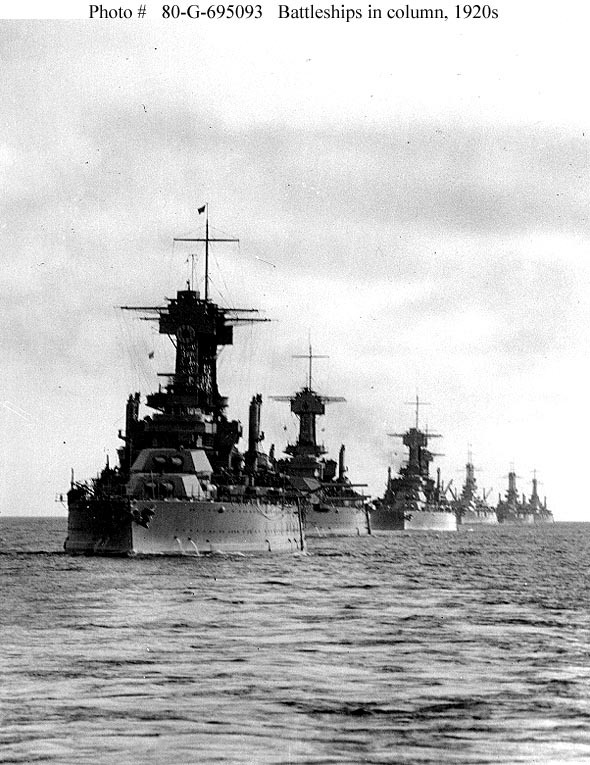 The heavy cruiser in the left center distance is either USS Quincy (CA-71) or USS Chicago (CA-136) . Anchored in Sagami Wan or Tokyo Bay, Japan, with other units of the U.S. Third Fleet, 30 August 1945. Mount Fujiyama is faintly visible in the distance. Missouri is flying Admiral William F. Halsey's four-star flag. Fires a salvo of 16-inch shells from turret # 2 while bombarding Chongjin, North Korea, in an effort to cut enemy communications, October 1950. Chongjin is only 39 miles from North Korea's northern border. This is a color-tinted version of a black & white original. The original photograph is Photo #: 80-G-421049. 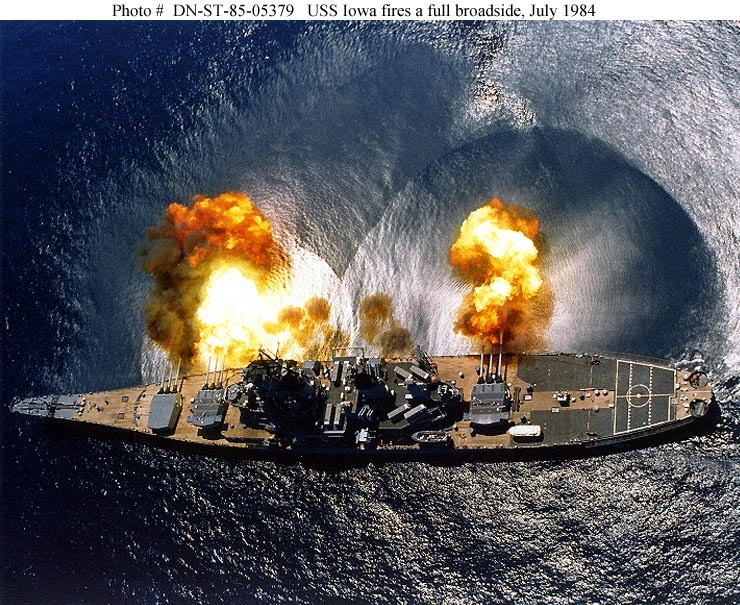 Fires a full broadside of nine 16"/50 and six 5"/38 guns during a target exercise near Vieques Island, Puerto Rico, 1 July 1984. Photographed by PHAN J. Alan Elliott. Note concussion effects on the water surface, and 16-inch gun barrels in varying degrees of recoil. Official U.S. Navy Photograph, from the the Department of Defense Still Media Collection.